Technology is an incredible thing. The thought that I can sit right here and tell you this on my couch while I am awaiting a grocery delivery from Peapod is really absolutely golden, isn't it? One of my anxiety triggers is the dreaded time in life to visit the grocery store for my family. It's always tough for me cause I'm either in a giant hurry or they don't have what I need. Or even worse: MY KIDS WON'T EAT WHAT I BUY. Now, I know this is hard to believe considering my life lives on the internet - but I NEVER shop online. Not because I don't want to - but because I can't even get myself focused to WORK online - but do my shopping online? Torture! When it's CLOTHES of course. But food? Piece of cake. I fell in love with grocery shopping online when my son Hudson was a baby and he ran out of diapers. I honestly thought I died and went to heaven when they delivered diapers to my front door the same day! And the best new baby gift? I give grocery gift cards to my new mom friends & they all love how convenient it is! You know how painful it is to cart around a car seat all day, right? BRUTAL! So take the stress out of it - book through Peapod! This week we're digging into Peapod wholeheartedly. I ordered on Friday what I want to have delivered on Monday. And since my family is heading out of town next weekend - Peapod is a no brainer! Want to see if it's in your area? Delivery Grocery Services in your area can be found all over the country! 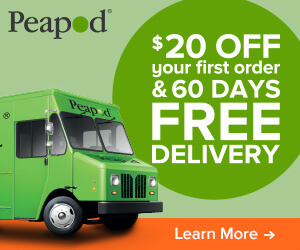 What are the 7 things I MUST get every Peapod delivery? What are the must haves in your grocery bags? OH - Be sure to sign up with this code to get $20 off your order and free delivery for a few months! THIS POST WAS SPONSORED BY SAVINGS.COM. ALL OPINIONS ARE OURS!